It’s not a real wonder that people just buy cans of pumpkin for making pies, or pumpkin pie filling. Yesterday (after a week and a half of asking what I should bring) my sister asked me to be responsible for making pies for Thanksgiving this year. Now I had a pumpkin from Halloween I wanted to preserve, so I agreed, thinking I could make some classic pumpkin pie from scratch. I also had a bag of tart apples left over from apple butter (which I got 13 pints out of) that were somewhat past their prime and would be good for a pie as well. And a pudding pie I have been meaning to make for ages. Seemed like a good opportunity to stretch my pie making skills. I forgot the cutting pumpkin takes muscle. Real muscle, like kneading 4 loaves of bread type of muscle. And doing a whole pumpkin? That takes endurance. Like “hand whipping two pitchers of eggnog and whipped cream” kind of endurance. Can I do those things? Heck yes I can! Do I want to? Err…. Suffice to say, I spent some 6 hours chopping up pumpkin chunks and apples, getting them prepped and finally managing to preserve four quarts of pumpkin for later. Every year I have a newfound respect for my mother who had to do all these things as a child and kept doing them for the rest of her life. It’s a particularly sharp reminder this year, as this will be the first year that she’s no longer with us. I feel a bit lost without her. I wish I had also listened more. So much knowledge left our family with her and will be a struggle to regain. Her years on a farm during the end of the depression would have been invaluable to me now, but those are also gone. If I had listened when I had the chance, maybe I wouldn’t have had to over cook my pumpkin pie because I didn’t boil the water out of the cooked pumpkin. But I did it. I made the pies. The apple pie is nearly perfect. And tomorrow promises to be a bright day. Last year at this time I was so very ready to get back into blogging. I talked about my new animals, the Christmas presents I was making, how exciting waking up on Yule was for me. The fervor of the holidays hit, and I got busy. When the smoke cleared I faced the hardest three months of my life as my mother’s cancer became no longer treatable. I won’t go into details, but to say it was hard is an understatement… And I hope that by the time I reach that point in my life, death with dignity laws are in place. The worst spring ever gone, some new friends and I started work on a project I’d been dabbling in the year before. The concept of a new home, a new life… Even a new society and culture. The concept of an Ecovillage. Now that my world is no longer falling to pieces, we’re making progress on the project. A little group of ten people, with various levels of dedication and participation, striving for a brave new world. One where we are at peace with our neighbors, one where we are socially and ecologically responsible, one where we live in harmony with nature, science and the world around us. Homesteading continues. 13 pints of apple butter, sealed in mason jars, went into my pantry this week. A gallon of dried apple slices sits in a bag on my counter. Dozens of hatching eggs were carefully packaged and shipped to other chicken fanciers across the United States. The biggest zucchini ever came out of my garden. And this week, a few cubic yards of mulched wood will go into my chicken pen. But this new project consumes my time. Crunching number and figures for feeding people, making building plans, water collection, sustainable animals, balancing our ecological footprint… My mind is a buzz with ideas and plans The future. I only wish there was one more person still around to hear them. This is a recipe that I think my readers with children will like. I was going to write today and talk about my rabbits but since they haven’t given birth yet I shant. They still have a few more days before I should worry, but since I misplaced my rabbit book a month ago I haven’t actually got the bred-date for them and I’m not really sure. Oops. So instead I am writing about home-made chicken nuggets. If you’d like the recipe feel free to scroll down, past the majority of this post, and retrieve it! It’s mostly just a bit about my thoughts on children (why I’ll never have them and why they’re suddenly relevant). The recipe is the important part! These nuggets are great on their own or with any sauce from ketchup to a fancy Dijon teriyaki. 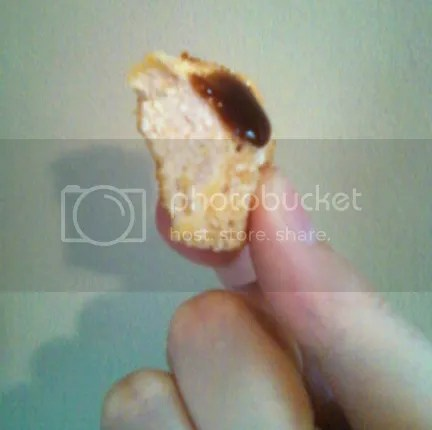 All white-meat chicken, with real bread crumbs and barbeque sauce! I decided to make these because my sister, who lives across the street is some 3-4 months pregnant. Now this mystifies me since she has four posh, primped dogs, a house she tries to keep spotless constantly, many fragile, expensive, and small decorative objects and collectors toys and generally has a strictly ADULT feeling environment. I just don’t get it when people have kids. “You will want a child too someday!” they all say to me. No, really not. Personally, if I wanted a parasite growing in my body and making me ill for nine months I could just as easily get some tapeworms… And if afterwards I wanted all of my expensive, delicate, collectors toys destroyed a hammer would be much more efficient. If I want all of my high fantasy novels and biology books decorated, I can sew myself tasteful slip covers and make acrylic paintings in them… Crayon-based “artistic” scribbles is SO dated. I already have dogs and chickens so no need to worry about a primal urge to clean up poop or nurture something. And if I ever want a sour milk-vomit smell permeating my house for half a year I can buy a gallon of milk and simply leave it out. All of these things seem much better, more tasteful, cheaper and easier to rid myself of if I don’t want them any more than a child. But I digress. It’s her call to spawn a new parasite upon the earth not mine. With her child on the way I realized that this spawnling will be living across the street from me and I will have to interact with it. Now people that see me around kids usually see my “working” attitude where I am good with kids and smile and have the patience of… Well, something with a lot of patience. They don’t see that behind that serene smile is a tightly clenched jaw, grinding teeth and a slowly rising sense of murder. The rest of the non-working time I am around children I am full of judgment for their failing to be adults yet and I have nothing for them but bared teeth and glares. “But you were a child, too once!” Everyone proclaims to me. Yes! I was and so I know exactly how awful they are and how their devious minds think. I was an awful child full of scheming plans and malicious revenge for those who stood in may way. The countless times I would deliberately get my siblings in trouble and punish my parents for failing to watch me every second of every day linger in my mind to this day like memories of another life… One filled with absolute power at my fingertips and a mad hungering for chaos and destruction. Luckily I managed to overcome that to become the person I am today. Children as a rule are not there yet, they are stuck in the power-hungry-chaos-destruction phase. Pretty sure this is the embodiment of all pre-pubescent children. But this child is going to have to fall somewhere in between patience of the gods and unbridled and openly expressed dislike. While it’s not a job, and I receive no benefit for caring about it in any way, I have a certain level of obligation because we share both DNA and neighborhood. If my sister was 200 miles away like my other sisters with kids I’d not care and would be content to express open dislike, but since she’s right across the way I have to put up with it to a certain degree. Besides which, my sister is a bit of an urbanite nutjob and this kid is going to need some perspective beyond their mid-sized Honda, their frequent trips to Mc. Donalds, their hairless dogs that they play dressup on, and their trying-hard-to-be-posh home. My sister is the type of person who is scared of eating my farm-raised eggs (hers come yolk removed, and pasturized in a carton but mine are “creepy”), wont eat a vegetable with weather scarring on it because it “looks funny” or “might be bugs”, washes all her vegetables and much of her fruit with a set of “produce brushes”, and will run for the hills if asked to eat something one day after the expiration date, regardless of the actual state of the food. So it’s had me thinking. 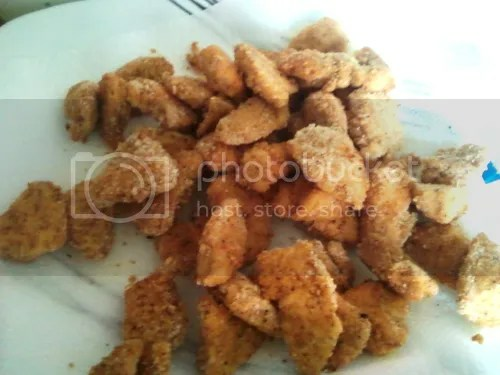 And thinking about being a kid again has had me desperately eyeing dinosaur shaped chicken nuggets at the grocery in the freezer section. While I’ve grown beyond mad, power-hungry destruction, I don’t think any of us should ever grow beyond dinosaur chicken nuggets. So rather than reach for that highly processed pile of goo I decided to make my own chicken nuggets. No dinosaurs unfortunately… But I can always watch Jurassic Park while eating them! For stupid picky children and even stupider, pickier sisters. 1 Large (or larger) egg, whisked with 2-3tbsp of water. Preheat your oven to 350(F). 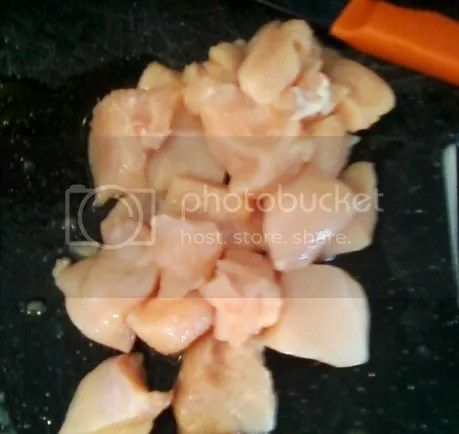 Pound your chicken breasts even and flat and cut them into 1-2in strips. Cut those strips into cubes or triangles. (I went for triangles-ish because sometimes I am still 5 years old.) I was very unspecific about sizing while making. 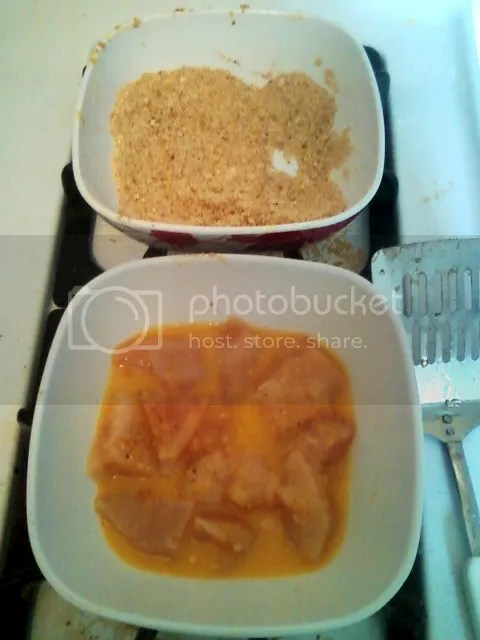 After that, measure out your bread crumbs and spices and toss them together thoroughly. You can do this “shake and bake” style by mixing them in a Ziploc but I just used a bowl. Whisk the egg really well so it’s completely combined and mix in the water too. Toss about 1/3rd of the chicken cubes/triangles/whatever into the egg mixture. Pick them out one at a time and let them drip off before rolling them in bread crumbs. Oil your baking pan/sheet with 1Tbs of olive oil. Lay your newly minted chicken nuggets out in it leaving a bit of space between them, like cookies. 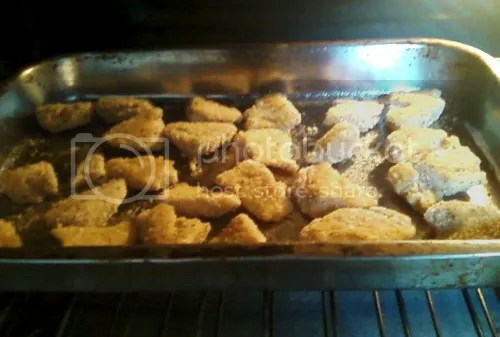 The amount of oil you actually need and the amount of nuggets that you can fit on your sheet will vary with what kind of pan you use. I was using a standard sized 9″X13″ cake pan because, well, I was. But the rule of thumb is one Tbs oil for every chicken breast and my baking pan held about 1.3 chicken breasts worth of chicken. 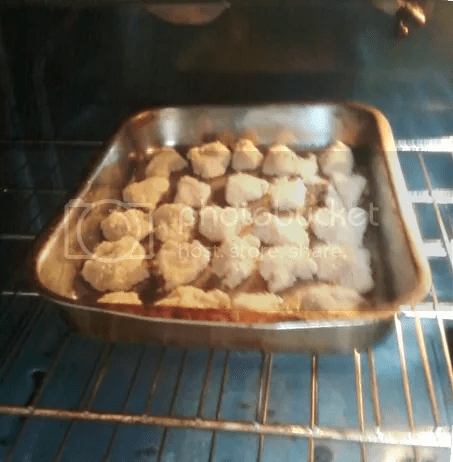 Stick the freshly layed nuggets in your pre-heated over and let them cook for 7 minutes. Once the seven minutes are up you can remove them from the oven and flip them with a spatula. The sides that were facing down will be golden and crispy. Now put them back in for another 8 minutes. Remove them from the pan onto a paper towel to “drain”. While nowhere near the oil level of something deep fried there’s still some oil on them that can drain off. Repeat until you run out of chicken and bon appetite! You can stick these in a Ziploc bag and freeze them once they’re cool and make huge batches for microwave lunches and the like! Today we said goodbye to the oldest non-human on the Homestead. 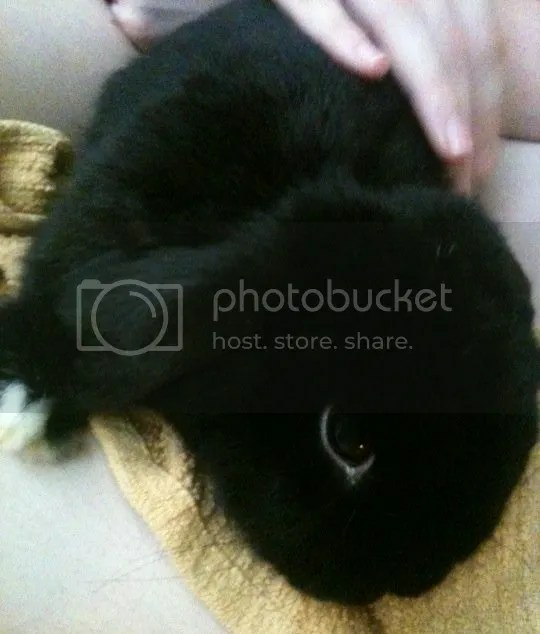 Cinderbunny was the first animal I was solely responsible for in my life; inherited from my sister at 15 and has been with me until today. 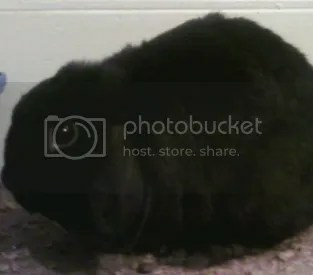 She was a dwarf lop with a cantankerous attitude. She would stomp her feet at everything, even choices she made. For a year her cage was next to my bed, at bed level. Every day at nine AM she would jump onto my chest, scratch at my blankets anxiously, stomp her little feet and then jump back into the cage. No amount of me jumping up yelling at her would stop this so I had to move her cage. Even still every time she left her cage of her own accord she would stomp. She was a destroyer of carpets, sweaters, towels (both paper and cloth) and fabrics everywhere. She had a taste for destroying soft things. She got along well with my dogs, teaching them with tooth and claw not to mess with bunnies, or at least that one. Persy would lay down for her and she would climb onto her with great joy as Persy fought to lie still and not play. She loved to tease the dogs. When we first got Chopin she wanted nothing to do with him. Later in life they got along much better. She appreciated his company in her ending years. In our apartment she got free run of the apartment of many occasions; a great joy to her since every floor was carpet! She hated hardwood floors. When we moved here I gave her a carpet all of her own to destroy. Recently she has been developing health issues. Limping, falling over when standing on her hind legs, not seeing well… She was older after all. Then we found blood in her urine one day, and without a rabbit-savvy vet to see we weren’t sure what to do. She was old already… Not long after our mind was made up for us. She lost the use of her front left leg very suddenly while safe and secure in her cage after months of limping. She began to just drag it under her, not using it at all. It didn’t take long at all, watching her fall on her side with every hop, to decide there was a better place for her. The only other option was amputation. She could no longer clean herself, she could no longer run free through the house, carpet or no. She would forever need her eyes and ears and fur maintained for her. She would have trouble getting to her food and water every day. She could not get in or out of her cage at all. So we made the call to have her euthanized. We did not want to do away with her like a meat rabbit. She was an old lady, a great companion, and a beloved pet deserving of much respect. She taught me much of what I know about rabbit care. It’s because of her that I got into rabbits in the first place. I will always be grateful to her. Lots of tears have and will be shed this week for a tragic but inevitable loss on the homestead. A ceremony will be held. Candles will be lit and we’ll burn sage to send her spirit on it’s way. Rest in peace, Cinder. I hope you find lots of dandelions and carpets over the Rainbow Bride. Well, my garden beds are finally in! We had the dirt delivered on Friday and on Saturday we set about moving all the dirt from my driveway the 150-feet to my back lawn. 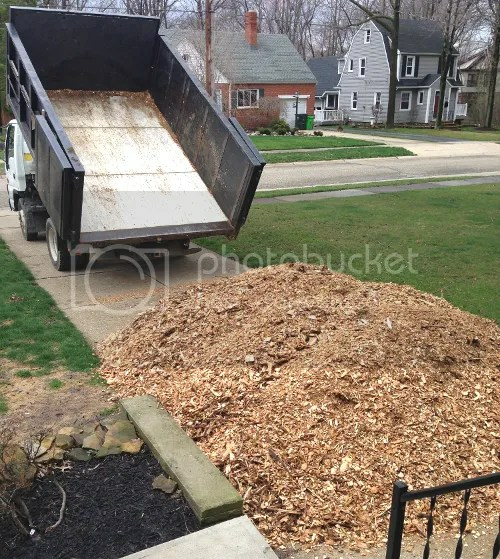 I ordered a yard each of leaf humus and garden bed mix (sand, topsoil and leaf humus mix) for the beds, 8 yards of untreated, unaged wood chips for my future chicken/duck pens and filling in the small lakes in my lawn… And an extra yard of bed mix for my sister. 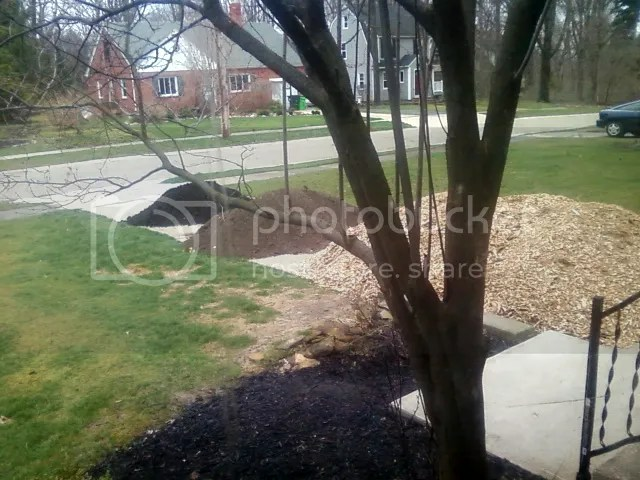 Dumping the eight yards of wood chips in my short, short driveway. This was NOT an easy task. We shoveled dirt and wood chips onto tarps and dragged them into the back yard. The real problem with this lies in the fact that my hip began to ache after all the stress of putting together the coop in five days. I haven’t mentioned this much but degenerative bone issues runs in my familly quite strongly. In all but one of my five sisters our hips, back, knees and even our ankles are a mess. Tendon and cartilage issues start cropping up in our early teens and by 14 we frequently find an arthritic like ache in our bones. There are days that my joints will pop apart multiple times in the same day and I can barely walk. It’s bad. Very bad. And beyond corrective surgery later in life there is nothing to be done about it. Most days I function just fine, but after doing nothing but manual labor on the chicken coop for five days, I had a severe ache in my hip. I knew it was my peculiar joint issues acting up. Despite this, when the dirt came in on friday, I took a tylenol and Greg and I went out to start moving the wood chips. After only one load, I lost my footing because of my hip, tripped and fell half-on the sidewalk to our yard, now messing up my knee on the same side as my hip. I spent the rest of friday limping around the house when I was walking at all, and the next day we had people coming over expecting to move dirt – and expecting that I would help. So when push comes to shove I grit my teeth and get things done. Things have to get done, bad joints or not. I spent the early parts of the day pre-making dinner for my friends. Then later, with three extra-strength painkillers in my system I went out and moved dirt and wood chips with the rest of them. I ended up spending most of the time prepping the garden beds that never got finished while most people carried materials. Double-digging was easier on my hip and knee than walking and hauling back and forth but it was still hard work. All the dirt in neat piles in my driveway, waiting to be moved. I was already injured at this point. 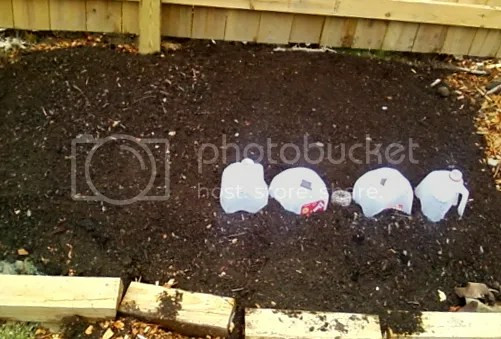 So I built the garden bed seen in the first picture, as well as a special one for my root veggies. I prepped the root bed well in advance. I double-dug my bed not once but twice, the second time mixing in sand and old leaves. Then a layed down a layer of newspaper, and on top of that went a few bags of topsoil I had in the garage. Next came the garden bed mix several inches deep. This loose, sandy, weed-free soil will be great for growing my carrots and beets, as well as shoving all my onion sets into. We will see what takes and what fits. I set my seedling carrots in the soil and covered them with green-house imitating plastic containers before shoving a few dozen onion sets in the ground. I am waiting another week or so before I try direct-sowing carrots and beets. My root garden bed, with covers over the carrot seedlings. The whole left half of the bed is filled with onion sets. For the rest of the garden beds I had to employ something a little faster. 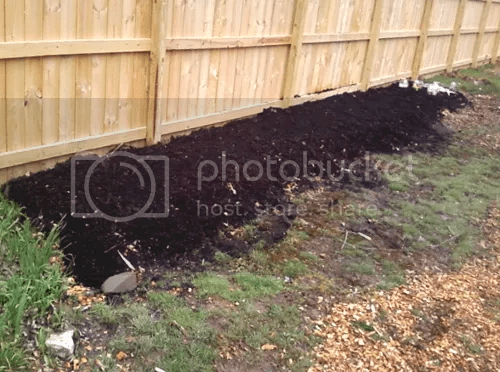 I did my best to quickly double-dig the mossy topsoil, and then raked woodchips over it to even the dirt out and help soak up the immesurable amount of water that we get in my lawn. It was raining lightly the whole time. 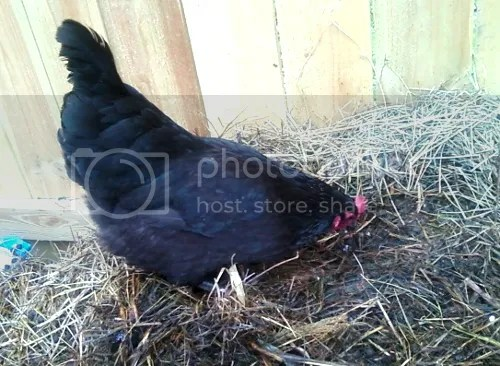 The woodchips will take nitrogen out of the soil, but I have chickens now that have extremely high-nitrogen manure; adding it back in won’t be hard. When the wood chips someday decompose they will be rich, organic, soil that will help break up our clay. For now they help smother the grass and weeds while leveling the ground for the next layer, which was the garden bed mix, a few inches deep. The layer after that was the leaf humus. Leaf humus is like infinately better mulch/topsoil. It’s full of nutrients including nitogen that get added to the soil as the humus beaks down even further than it has. In the state I got it in it hasent quite finished decomposing so it’s a wonderfully loose soil without being sandy. It won’t support huge roots, but it will nuture seedlings quite well, and maintain moisture deeper in the soil. This is the same sort of stuff that nutures whole forests into being! The rest of the wood chips filled in the foot-plus deep gap across my whole end 10 feet of lawn. My ground suddenly plunges down back there and the wood chips fix that, in addition to being a good chicken pen beding. They too will break down into the most fantastic topsoil some day, even faster than those in my garden beds. After all the dirt moving was done we retired indoors for Thanksgiving in April! 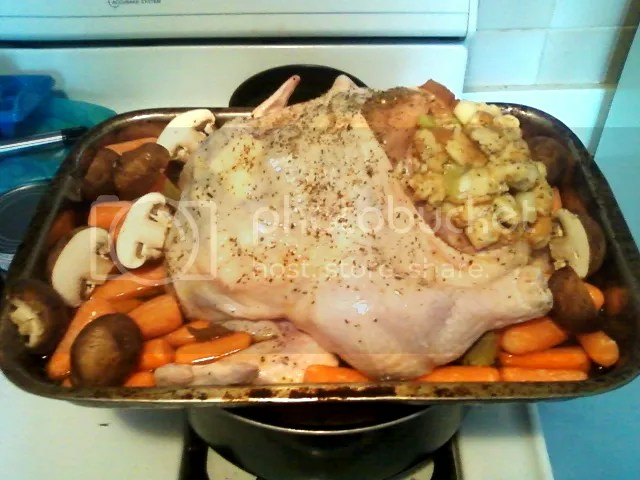 I made a whole roast, stuffed chicken laden with veggie sides and biscuits! I prepared everything early in the morning so all I had to do was turn the oven on. It was awesome. Not one of the girls laying eggs for me, though perhaps their someday fate. Obviously this is not a square foot gardening project; the nutrient levels in the soil are not high enough. I am not doing any growing-compatible-plants-together, and I’m giving each plant plenty of space. I am just trying to get a significant amount of plants growing strong enough to give me some great and maybe even abundant fresh veggies. My tomato plants have been wilting and not growing lately. I did some research and found out they were cold stressed. My house is 62 degrees. Is that really so cold? They’re two months old and only two inches high. They should be eight by now. I poured some manure tea made from the chicken poo on them, put the reamining solids on top of the soil and stuck them into Ophidian – my snake’s – cage along with one of my stunted peppers. The result? In 24-hours their leaves etended, they stood upright and began growing again. They have some catching up to do but Ophidian’s light is 24/7 on half of his cage (the other half is dark and both halves have hiding spots if he wants it dark) so the plants should start growing again rapidly. They’ll be about a month behind, but I think they will make it. The yellow is fading from their leaves. It looks like I will have several tomato plants that will grow big and strong, unlike my mere three peppers. My kale is questionable at the moment along with my carrots, but my arugula’s going strong along with my one, large pumpkin plant and my two+ extra-large corn. My spinach, basil and parsley have all begun sprouting as well. And my peas… Well, where can I start? My peas are huge, strong, beautiful and will likely be the most bounteous of my crops! 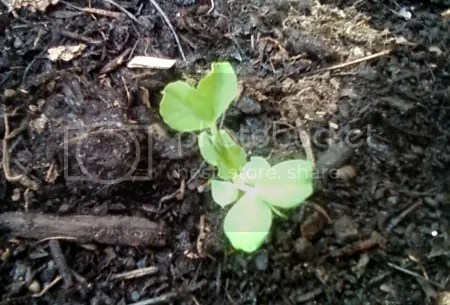 I have six seedlings in the ground and their leaves are extending madly already, their roots plunging extremely deep into the ground. Peas are amazing. One of my six, beautiful peas, growing huge and stong! And the chickens. They’re in the garage still, and will be for a few more days but the day after we got them they gave up three lovely eggs. Every day since we have gotten two eggs consistantly. I love it; it’s like easter every day and these eggs taste awesome! They still haven’t gotten the hang of laying in their nest boxes but I found one egg in one nest box twice now, so maybe they’re getting it! 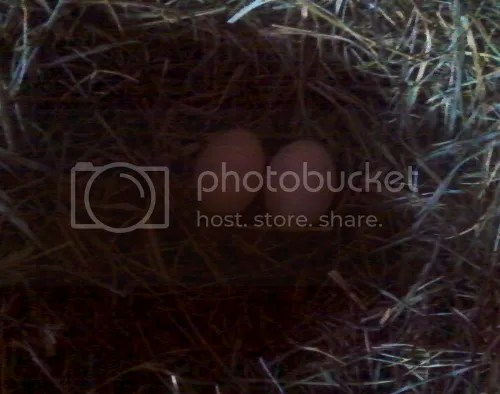 A too-dark picture of our first two eggs in a nest they built in their “run”. 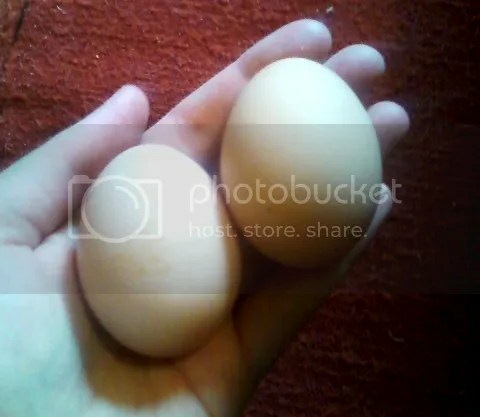 A much better picture of the same two eggs indoors. So beautiful looking! I gave four eggs to my neighbor who was happy to get them. I told him I had some hens I’d be moving out back as part of an uban farming project and he was extremely accepting of the idea. He complimented me on my nice fence, thanked me for the eggs and after a bit of light conversation and asuring him they wouldn’t make a peep at night I went on my way. It was a good conversation and I’m glad my neighbor has no qualms with my birds. The chickens have also been having fun eating every veggie scrap and lawn clipping they can get their beak on. I have been bringing them outside with me. Their wings are clipped but I have been setting them in enclosures anyhow, just to be safe. I have been bringing them out one at a time. At first I was putting them on the compost pile in a dog crate, but then I stuck them in the empty rabbit cage to clean up all the spilt feed (especially the cracked corn) that had fallen into the cage. But today I brought out the third chicken and let her just sit and browse on my compost while I cared for the rabbits cage-free. She immediately set to work eating all the seeds that the mice leave behind in their bedding. She did not try to fly off, or even move off the steaming compost. She just kept digging for goodies until I brought her back in. She was dang near silent the whole time she did her job of turning my compost. In the end I just picked her up and brought her in and she didn’t fuss at all. I hope she didn’t over-eat with all those goodies out there! Copper Chicken cleaning out as much as she could from my compost pile. And because today is such a long and picture-heavy post I figure I’ll throw in a bit about one of the plants I’ve been investigating lately. It seems to be one of the few things that is prolific in these areas, and it is called Deadnettle. 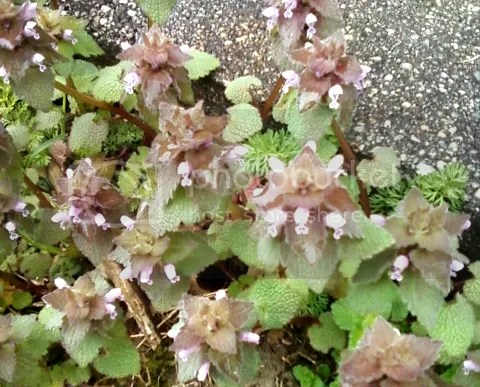 A huge patch of deadnettle by my garage. It is known for being a bitter plant with edible tops that tends to repel rabbits due to flavor alone. It’s indigenous to europe but is a non-native invasive here in the US. It helps to attract bees early and late in the year when there are few flowers around and is extremely cold-hardy. My rabbits and chickens aren’t too picky so we’ll see how they feel about this edible “weed” some time. They’re all around here and if they like them then I may try to cultivate them some. They might even attract bees to (and repel wild rabbits from) my gardens! Here’s hoping! I still have a yard of dirt in my drive for my sister, and I need to color-mark all the baby bunnies and can some chicken broth (not to mention start more seeds) so the work is never done. Maybe next time I will finally get some shots of small, cute, fuzzy animals to post. Seven baby rabbits seems to have been all it took to make things turn for the better. They have grown rapidly. Generally it’s been cold and I haven’t been checking on them too closely but last night I found their seven squishy fluffy warm bodies laying like sardines in the nestbox, completely uncovered. Some of them have started opening their eyes, they are all well-furred and their ears are growing out! This litter is also growing VERY quickly. They are not even two weeks old yet but they are HUGE and chubby. 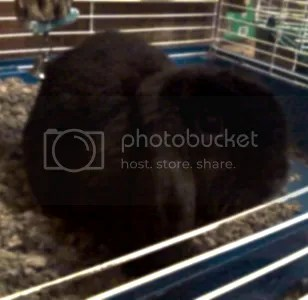 Purina, the mother, is eating almost two cups of food a day, maybe more, in pellets alone! Greg and I have decided to keep one of the does from this litter to raise for our own use to replace Evo or even Purina as she gets older. These rabbits have to be at least 6-8 months old before you can breed them and who knows what those six months will do to Purina’s breeding capabilities. I’m hoping nothing but she’s getting older. The fact that she can produce a litter of seven at 3 years old is impressive! I did re-breed Evo. She is on her last call for a live litter. Normally I would not be breeding her again, but she IS an experienced mom and I bred my Rex, Kibbles, at the same time. Since, if this pregnancy takes, it will be Kibbles first litter it’s possible that having a second mom (even one with a small or dead litter) would be a great boon to keeping the kits alive! Some of my new plants are sprouting! As I said before, the Kale and Arugula ARE in fact popping up but more surprising is the swift and powerful germination of our peas, which exploded with life almost immediately. No sprouts have come out of them yet but if you nudge the dirt, these tiny dried-up seeds have become huge, broken open monstrosities with shoots coming out. Not a bad thing at all! My spinach and my non-heirloom/organic herbs are in seed starters too. I bought the herb seed packets for funsies one day and I figure I should grow them! I will also be trying to grow non heirloom but still organic beets and cucumbers that I bought seeds for at the last minute. Whew! And work on the chicken coop has begun! 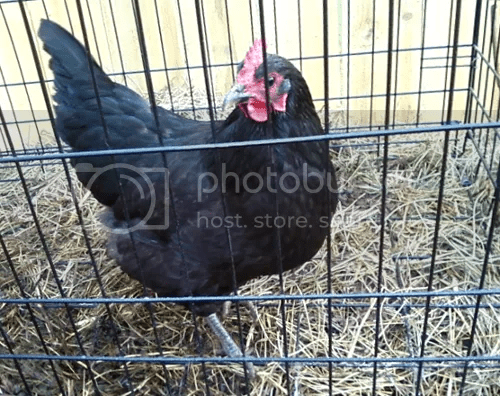 A nice lady with some australorps agreed to try to hold them for me while I got my coop together! My brother in-law and I went out to Home Depot and heaved large peices of lumber and cinder blocks into the back of his smalish car. With some cramming (and some probably illegal beams-sticking-out-the-windows-of-the-car-as-we-drove) we got all of the non-deliverable peices of my coop home at last! Today I can start work on it! But I may have gotten the wrong size screws. Again. Derp. This weekend Greg’s mother and two of his siblings came to visit. It’s a little annoying for both of us when they only visit for one day like they did this week. Greg always is left feeling like he didn’t get to spend time with them. 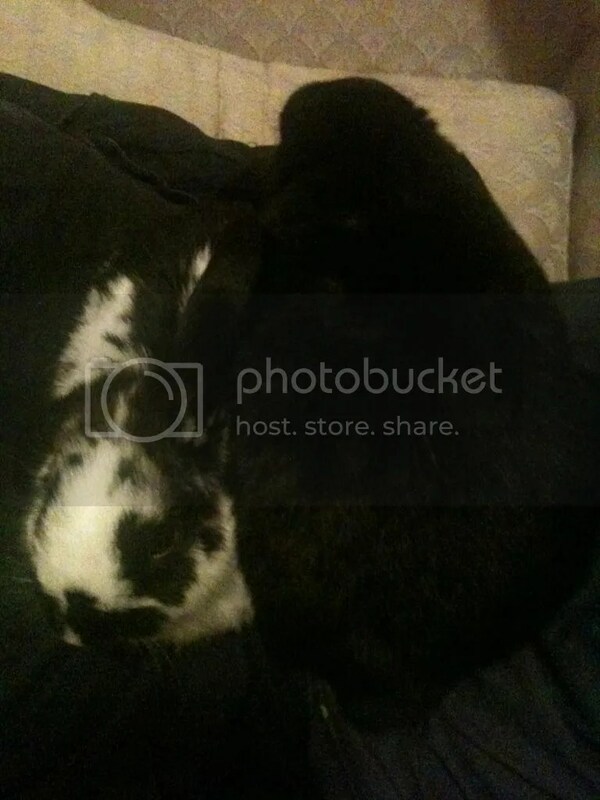 Personally, I wanted to show off my rabbits and didn’t really get to. Also it’s so much work to make our house so clean for someone who is showing up for one day. On the brighter side, however, we got my mother out of the house for an awesome breakfast and she had a great time! It was so good to see her smiling and laughing and acting normal again. I think with this she may end up with the confidence to go more places more often despite her medical issues… And that’s good. She needs to get her normal life back to be happy. Today I work on the coop and place orders for garden dirt, wood chips for filling low areas of my lawn, and for the last of my coop supplies! It feels like spring is FINALLY getting here so I better get to work on it! Wish me luck! 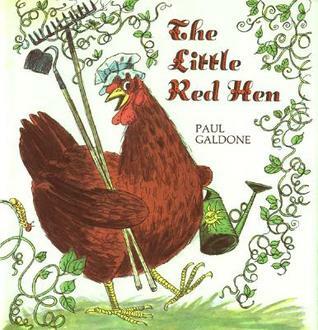 Lately I have been feeling a little like the Little Red Hen. I entered into this whole “farming” thing with the idea that in the end, no matter how much I care about my animals, friends and family this is a business. Because if I can’t pay for the feed, I can’t keep the animals. So far it’s going well. I have sold two of my rabbits to a 4Her, and two more are going to, of all things, a taxidermist. After that I have one person who is interested in buying some of the meat off of me. The rest will go into my freezer or into the bellies of the people helping me do the processing. Okay, well maybe it’s hard to compare killing an animal to baking bread. But the fact that it was bread wasn’t the point. The point was that the Little Red Hen did ALL the work, and at the end all her friends wanted to reap the rewards of it. In this case, I have NO problem with people not wanting to attend. Processing animals is NOT for everyone. But the fact that every single one of them decided to invite themselves over for dinner afterwards without a thought wrankles my blossoms. In fact it reached the point that my sister was going to host a seperate party the same day with some of my friends, and then they were going to come marching over to my house afterwards for dinner. At this point I have had to put my foot down. I am right teed off with these people that are my friends and family. They want nothing to do with the work, some of them haven’t even visited my house and looked upon the rabbits that will become dinner next week. And yet every single one had the audacity to invite themselves over for JUST dinner. And I do mean EVERY single one that did not want to process. To the point that even Greg felt he could leave the house to play video games with my brother-in-law for the processing, and wanted to just come over after it was all done. I have had to put my foot down. I have made it clear that ONLY people interested in and capable of actually processing the rabbits would be allowed to come. I am NOT feeding 10 people for doing nothing, them not even being willing to be there during the process. I even told Greg that he was one of these people I was mad at. If he wants to eat any of the rabbit I harvest next week, he will at the bare minimum be inside the house, turning cleaned carcasses into individual cuts of meat. While he and I are “in this together”, it’s me every day that goes out and feeds the animals, does the work of cleaning the cages, checks their health, gives them their toys and treats. On the occasions Greg comes out to help he is very absent-minded and never focused on the task, sometimes even hindering more than helping. If he wants to eat the work I put into these animals he has to at the bare minimum be there for me. I think that is reasonable to ask. If you want to eat my food, you should be willing to put forth some sort of effort in return, because for ever pound of food that gets eaten, that is a pound of meat I can’t sell but I put hours of work and money into. This is a business, not a non-profit soup kitchen for my friends. Sheesh! As a result, I may only have two people attending. My best friend, and another friend that is a merchant in a medieval society. But if those are the only two willing to participate, then those are the only two I actually want there. And those are the only two I will be feeding. Everyone else is tough out of luck!